A little bit about myself. I am finishing up my first year of my Master’s degree at Indiana University (IU) in Horn performance. I attended Fullerton College and California State University, Long Beach (CSULB) where at the latter, I obtained my Bachelor’s degree in Music Education with an emphasis in Horn. 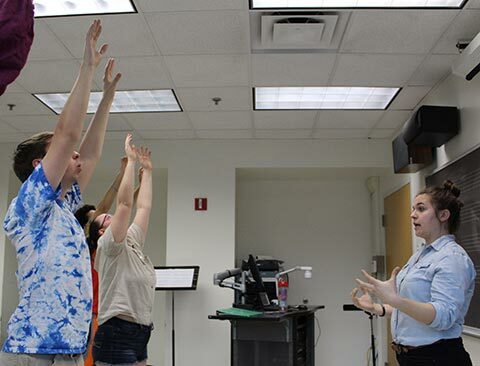 Though I was familiar with some of the exercises in The Breathing Gym from high school Marching Band, it wasn’t until I began studying with Dylan Skye Hart at CSULB that I was introduced to The Brass Gym, and began looking into The Breathing Gym more intently. Dylan studied with Mr. Sheridan and gained firsthand experience on how to use the books and practice the routine. Since then, I have been using a combination of both The Breathing Gym and The Brass Gym in all of my various teaching opportunities in K-12 public schools and during my graduate studies at IU. How I Use It and Why I Love It. So let’s go through my process. On a good day, I spend about 45 minutes on exercises from The Breathing Gym and The Brass Gym combined. The idea is that I practice both Flow Studies and Strength and Flexibility exercises from The Breathing Gym and practice the first seven exercises in The Brass Gym. In The Breathing Gym, the purpose of the Flow Studies is, “to move air without resistance or tension, sometimes quickly and sometimes over longer periods of time” while the Strength and Flexibility exercises, “expand and contract the lungs and breathing muscles from full capacity all the way to empty.” In other words, as my teacher Dylan explained, Flow Studies bring you from 80% air capacity to 20% lung capacity, the ideal comfortable levels of lung capacity to maintain during performance, while Strength and Flexibility exercises take you from 100% to 0%. Over time, Strength and Flexibility exercises will help improve your Flow Studies, or increase your, “range of motion into [your] singing or playing with greater ease” but should be taken with some slight caution-these are the exercises that can cause you to become light-headed and in other circumstances, make you pass out! Usually, I pop in one of the many YouTube videos (my favorite here), or do some of my own exercises for about 10-20 minutes at the beginning of my first practice session of the day. From there, I begin my routine from The Brass Gym. The routine recommended to me by Dylan and even suggested by John Ericson, editor of The Brass Gym for horn, is to start with Mouthpiece Work through Beautiful Sounds. This routine usually takes me about 20-30 minutes, and can be done with breaks between exercises. Now, the book presents a lot of terms, each very important to know and learn, but my favorite by far is the, “Law of Accommodation” which states, “What is difficult today will become easier if practiced”. This is my favorite principle of the book and general playing of ANY routine. The idea is to always approach each exercise from an area of good tone and general ease/relaxation of playing, and THEN to begin to incorporate each of the different challenges and criteria specific to the individual exercises. Another part I love about this routine is that you start low and stay low. For me, this promotes the best kind of relaxed air, helps me start the day with a loose and flexible embouchure, and helps me expand on the Flow Studies exercises from The Breathing Gym. Ultimately, The Breathing Gym and The Brass Gym are what you chose to make of them. Have fun, take a deep breath, and go! Always come from a place of relaxation and good tone. Dynamics, articulation, and speed are second. For classroom and sectional teaching, use any 5-minute Flow Studies exercise from The Breathing Gym to help increase student focus. The “Law of Accommodation” should always be considered when doing any of the exercises. The Brass Gym expands on The Breathing Gym, so air should always be considered and thought of as if you were doing a Flow Studies exercise. Try to analyze the lines in the thought of a, “This is a 3 counts in, 18 counts out” exercise. Keep Flow Studies and many of The Brass Gym exercises with an even inhalation and exhalation- resist the urge to crescendo and decrescendo with your air, and don’t hold onto dead air. Take in what you need evenly and relaxed, and exhale it evenly and relaxed. 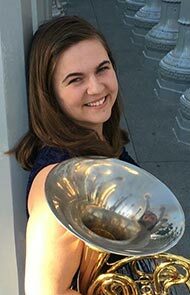 In pursuit of her Master’s degree in Horn performance, Sarah Krueger currently attends Indiana University where she studies with Jeffrey Nelsen, Dale Clevenger, and natural horn with Richard Seraphinoff. A California native, she studied at both Fullerton College and California State University, Long Beach earning a degree in music education with an emphasis in Horn. She has studied with a variety of teachers including Jerry Garvin, Justin Hageman, and Dylan Skye Hart. Sarah has been featured as a soloist performer with the Southern California Philharmonic, and has freelanced across California having played with various groups such as Symphony Irvine, Dana Point Symphony, the Orange County Symphony Orchestra, the Corona Symphony Orchestra, Symphonic Winds of the Pacific, Pacific Brass, the Hollywood Chamber Orchestra, True Brass Choir, as well as the Bob Cole Conservatory of Music Orchestra and Wind Symphony. When she is not performing, she enjoys spending time with her three-year old lop rabbit, Cooper.